The rapid evolution of the worldwide web has provided general access, unimagined even a decade ago, to information of many kinds. As a medicinal chemist involved in drug discovery, I have seen access to the basic information of drug discovery—drug structures, drug effects, and drug targets—evolve from print-only format (comprehensive but difficult to update) to proprietary computer databases (easily searchable but expensive and with no public availability) to the current situation where a surprising amount of sophisticated information is freely available via the internet. This article is intended to draw attention to one particularly useful source of information, Drugbank1 <http://redpoll.pharmacy.ualberta.ca/drugbank/>, which was designed and created by Dr. Wishar and his colleagues at the University of Alberta. This free resource pulls together a surprisingly comprehensive amount of information on drugs and drug targets and contains data on over 1 000 marketed and over 3 000 additional experimental drug substances. 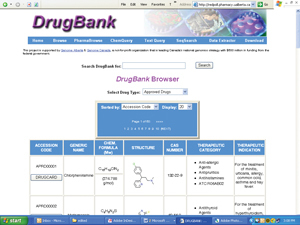 The Drugbank homepage (above) displays links to multiple search options, Browse, PharmaBrowse, ChemQuery, TextQuery, SeqSearch, Data Extractor, and a Download feature. Information can be accessed in a number of ways ranging from simple text queries to more sophisticated structure queries using a ChemSketch applet or SMILES string input via ChemQuery. DrugCards (accessible via the Browse function) provide drug-related information, including indication, pharmacology, and mechanism of action. Active hyperlinks to the FDA label and other information may also be available. The DrugCard also gives information on the drug target, including function, and protein sequence information, along with hyperlinks to the 3D PDB structure and polymorph information where available. The PharmaBrowse function allows users to view drugs grouped by indication and the Data Extractor allows users to search over various combinations of database fields. The Download feature allows users to save structure files, DrugCards, protein sequence, and DNA sequence data. I became aware of the Drugbank database while working on project 2004-025-1-700, which was initiated in 2005 within Division VII with the objective of providing a compendium of drug and drug target information for the top 100 drugs. As work on the project proceeded, it was clear that our envisioned product was already outstripped by information sources such as Drugbank that were available on the world wide web, and the project was recently terminated. I would like to take this opportunity to acknowledge the hard work of the project contributors, Janos Fischer, Stefan Jaroch, Susan Dana Jones, Michael Liebman, and Erika Alapi, Attila Szemzo, Mark Samuels, and Tom Perun. Dr. John Proudfoot <jproudfo@rdg.boehringer-ingelheim.com> is distinguished scientist with Boehringer Ingelheim Pharmaceuticals Inc., in Ridgefield, Connecticut, USA. He is a member of the Subcommittee on Medicinal Chemistry and Drug Development of the IUPAC Chemistry and Human Health Division.